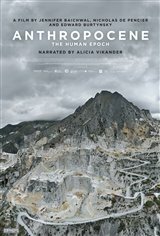 Not long ago, scientists announced that they believe we have entered into the Anthropocene Epoch. The new name reflects the fact that humans now change the Earth and its systems more than all other processes combined on the planet, which is causing mass extinction of many species, not to mention climate change. Spanning six of the seven continents and 20 countries, this documentary, narrated by Alicia Vikander, reveals how our determination for conquest over all has created a global epidemic. In Kenya, mounds of elephant tusks burn in a devastating display of the impact of poaching. In Russia and Germany, mining operations transform terrains into otherworldly industrial wastelands as hypnotic, colossal, lifelike machines endlessly extract on an unfathomable scale. These images serve as a wake up call to do something about the destruction caused by our dominance. These are not projections of the future, this is a reality that is already happening and we are shown why something needs to start happening immediately if we are to change course and save the world and humanity from extinction.